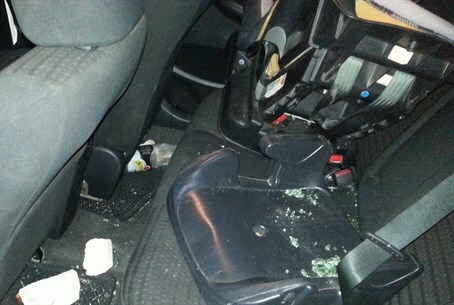 A man and woman in their 30s suffer minor injuries as Arab terrorists throw rocks at cars in the Western Shomron. Two Israelis, a man and woman in their 30s, suffered minor injuries on Tuesday night, after Arab terrorists threw rocks at their cars as they drove near the western Shomron (Samaria) community of Oranit. The two were taken to the Beilinson Hospital in Petah Tikva for treatment. Earlier in the same area, an Israeli bus driver was injured when attackers hurled stones at his bus as he drove on the road between Alei Zahav and Oranit. The driver suffered a head injury in the attack, but managed to drive to the nearest checkpoint to seek help. Paramedics gave him initial treatment at the scene, then evacuated him to hospital in light condition. The rock throwing attacks are the latest in five consecutive days of violence. On Tuesday morning, an Arab sniper shot and killed a civilian IDF worker near the border with Gaza. In response, the Israeli Air Force (IAF) struck multiple terrorist sites throughout Gaza. On Monday afternoon, a police officer was stabbed and seriously wounded by an Arab terrorist just north of Jerusalem. The officer's condition has stabilized following surgery, in what doctors described as a "miracle" given that the 15 centimeter (6 inch) knife struck very close to the officer’s heart and other vital organs. On Sunday afternoon a bomb exploded on a Bat Yam bus. Only one person was wounded in that attack on Sunday afternoon - a far more tragic outcome was avoided only by an alert passenger and the quick reactions of the bus driver who evacuated the bus as soon as the suspicious package was spotted.